Well, it's almost a New Year! And I hope it will be a great one for all of us, the last one sure has been a roller coaster ride hasn't it!! The Twelve Dozen in Twelve Months Challenge is about to be in full swing!...and already I'm having such fun...as I'm on the design for #14 today!! MEDIUM - for blocks 9" to 14"
LARGE - for blocks over 14"
Of course, you can mix and match on the same CQ Block if you like...it would add some variety...and your eye will tell you if the scale is right or wrong. Remember, no rules here...this is your challenge, your work, your project, your pace. 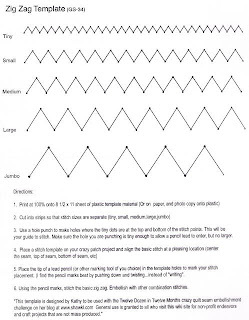 Later in the year, when I run out of "zigzag" ideas...and add another basic stitch...I'll create a template for that/those as well and post it to the Wiki site as well. So, get ready...hang on, this crazy ride is about to leave the station!! Woo Hoo...all aboard!! 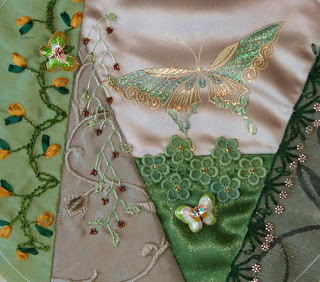 One of my personal goals in 2009 is to become much more proficient in stitching Crazy Quilt seams. So, to keep me motivated I am starting a challenge for myself. 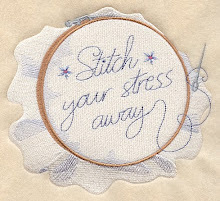 You are invited to stitch along with me. I will stitch 12-dozen (that's 144) different seams over the next twelve months. (Okay, life got in the way of my deadline...but I'm still going to create the 12-dozen. We'll just have to see how many months it will take me! Actually, I still think it is a very do-able goal to just do the stitching. 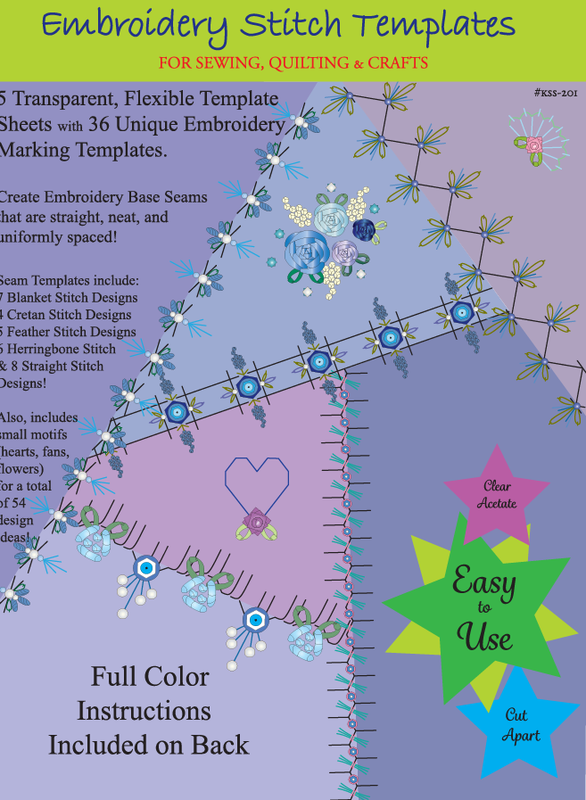 I did not consider the extra time to doodle the stitches, create the visual line drawing in Illustrator (which I had to learn to use), stitch the example, photograph the finished seam and resize to fit the blog, and write the blog entry and post!!) 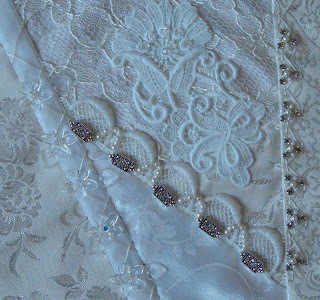 My intent is to expand on basic stitches that all should master quickly. So, this is going to be at the beginner level. And, because I love beads...most (if not all) will surely include beads. 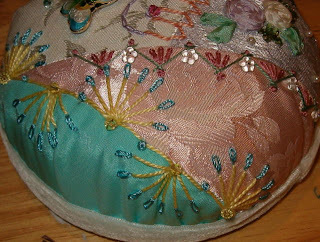 However, for those of you that don't like beads on your work...I will accomodate and stitch half of the example with beads and half without. 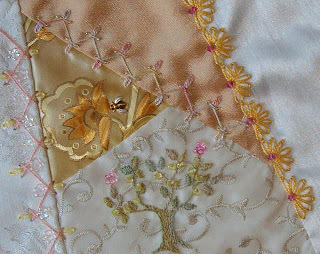 My work will be on a sampler cloth, although if I stitch on projects I'll share those as well. 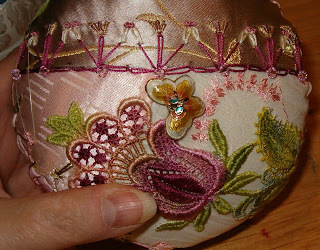 Each week I will post some stitches using a basic stitch as the starting point. 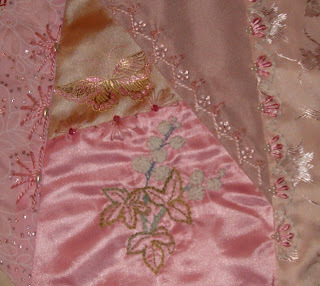 I will post a photo of the stitched example (bead and no bead) and the stitch chart. Feel free to use them to expand your stitch library. 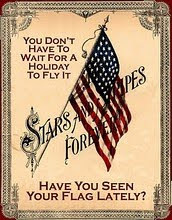 These are my designs and my stitching...so I ask that you honor my request not to use them for any endeavor of profit. Thanks. Can't do a colonial knot or Hungarian braid stitch? Yeah, me too. And for a few months now I've been kinda hung up on my "lack of ability" instead of concentrating on my "ability"...more on the negative than the positive. (Weird, cause that's not usually me). 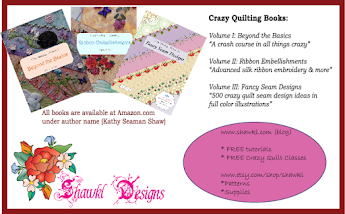 But, just recently, while looking through Carole Samples book Treasure of Crazy Quilt Stitches (which I just love) I was struck by the awesome number of stitches...that were really just a mismatch of simple stitches that I CAN MAKE! So, I decided to take a simple stitch...the zigzag...and add to it. I added lazy daisy, straight stitch, and french knot only. Those I can do! And was amazed at how far I could add to the basic lowly little zigzag...with no real effort. So, I stitched up a sample to share..hoping that someone else might be helped to see that there is very little "magic"...just start stitching and see where it takes you. Now, I don't advocate not learning new "established" stitches...but I say "Don't wait until you feel you are a SKILLED stitcher" just use what you do know and go for it! 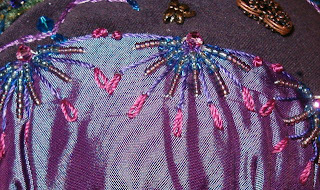 On each photo, you will see two rounds of the stitch progression...I stitched in various color so you could (hopefully) see how the stitch builds from the basic zigzag. I challenge you to take the basic zigzag...and add to it using only the french know, straight stitch, and lazy daisy. Change up the size of the thread...change up the colors...change up the height and width...shake things up. I'd love to see what you come up with...so will start a new string on the HGTV Message Board for needlework/quilting to share this blog and give you a place to post your photos. Okay, I know you're probably tired of seeing pin cushions...but I just can't stop! I am working on some Round Robins, but can't share photos of them since I don't want to spoil the surprise! My six beautiful penpals from Russia received their Christmas gift from me. Yep, you guessed it...pin cushions. One (my very first effort) is pictured in my Borrowed Pin Cushion posting. But, now that all have arrived, I'll show you the other five. Am also working on the usual Christmas decorating and family things this month, so not getting as much stitching done as I'd like too. But having fun just the same! As you can clearly see, I worked each in a different color. I did not specify which lady received a specific one, as I wanted them to pick the one that they most liked. I used my stencils for most of the seams and the tissue paper overlay idea for the trees. 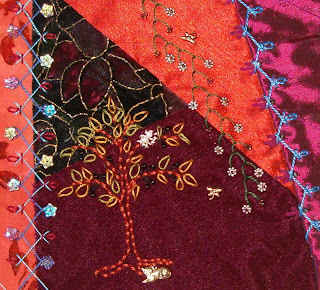 I've been busy working on some crazy quilt round robin blocks, and having a ton of fun! But, I can't show those since only small "peeks" are allowed. 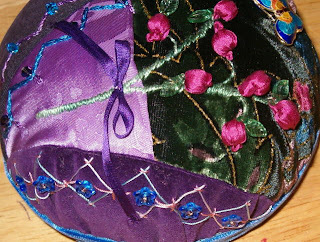 So, I'll show you some shots of three more pin cushions I've been working on. These are already mailed and received...so no secrets here. I cut the tops of the photos...haven't done that in a long while...so the shots are not complete. Instead, they are mostly of the stitches enlarged. But, sometimes, that's better I think...you can see how to complete them and I hope you try them out. Enjoy!